As soon as I heard the news about the exodus of foreign workers and the humanitarian crisis facing the refugees, I quickly travelled to the border between Libya and Tunisia to document the tragic events that were unfolding. Following internal fighting between troops loyal to the Libyan president and rebel forces, hundreds of thousands of foreign workers caught up in the middle were forced to pack their bags and flee for their lives from the conflict engulfing a large part of the country. The lucky ones among them managed to cross the border into Tunisia, more often than not after a long trek on foot. By 4 March I was already in Tunisia, and at dawn the following day I landed in Djerba. I realised how dramatic the situation was as soon as I left the airport, which is more than 200 kilometres from Ra’s Ajdir, on the frontier. Thousands of Egyptian workers had formed endless queues around the airport. At first I thought they were waiting for an aeroplane to take them home, but later I found out that the airport had become a sorting centre. How did things work? Depending on the date they had entered Tunisia, the workers were waiting to be taken by bus to the region’s largest port, in the town of Jarjis. There, the Egyptian government had readied ships for the long-awaited repatriation journey. It was there that I first made contact with the refugees. I was deeply moved by the desperation with which the people ran to the buses as soon as their turn came. Their passports were kept by those organising the evacuation. Gathering around the vehicles, the people waited fearfully and impatiently until they heard their names called out. A short gleam of triumph flickered across their faces when their names were called out. Then, they determinedly picked up their enormous baggage, which they had carried on their backs for hundreds of kilometres, stuffing it as best they could into the crammed buses. That baggage contained everything they had saved up to buy for months or even years. In ninety-nine per cent of cases, the value of those goods was no more than a hundred dollars, even if they weighed tens of kilos. But for those poor people, it was their sole wealth. I then spent two days at the refugee camp near Ben Gardane, where I arrived at around four o’clock local time. As I approached I could see thousands of tents glinting in the sun. The tents had been erected by UNHCR and other humanitarian organisations. There were around seventeen thousand refugees from Bangladesh, Somalia, Sudan, Egypt, Nigeria and other countries in the camp at the time. The conditions on the ground were indescribable. There were no toilets, except for a few made available to the women and mothers with children. Thousands of refugees had to go to the toilet in the open. Everywhere you looked there were interminable queues. People waited for hours on end to receive a bottle of water and a plate of food, without any guarantee that they would get anything else to eat or drink after that. More often than not, when the pasta with traces of tomato sauce ran out the queue was just as long as it was when the food started to be distributed. In all honesty I can say that the whole place was crisscrossed by permanent queues: there were endless queues of people at morning, noon and night. The lucky ones managed to get something to eat, while the others had to content themselves with only a little water. The refugees from Bangladesh were the most numerous, as well as the most disciplined. The humanitarian workers, the soldiers and the Tunisian volunteers loved them for their good behaviour. Unfortunately, they seemed not to receive aid of any kind from their own government. As a Romanian, I had the same feeling of not being assisted by those responsible for doing so. Things were harder with the refugees from sub-Saharan Africa. More often than not, they tried to jump the queue and fights and arguments would break out. So as not to lose his place, each refugee tightly clasped the arms of the man in front of him in the queue. They formed a solid chain of human desperation. Mattresses and blankets were highly sought after, since in the evening and at night the temperature did not rise above 10 Degrees. The humanitarian organisations did a very good job, given the size of the exodus. They would not have succeeded without the help of the Tunisian volunteers, however. Thousands of private individuals and companies arrived with lorries and in their own cars bringing water, food, blankets, clothes, whatever they could. The Tunisians were still inspired by revolutionary fervour, and this made them more sensitive to the humanitarian crisis happening in their country. Throughout the camp could be heard the chant: Tunisia mia-mia (Tunisia the good)… Libya ali-baba (Libya the bad). Every day thousands of refugees continued to stream across the border through Ra’s Ajdir. Trying to flee Libya, some of the luckier ones managed to travel by bus, but other covered dozens of kilometres on foot. The majority had stories of being stopped by the armed forces, who confiscated any money or mobile phones they found on them. Every day, the international organisations aimed to evacuate a number of refugees larger than the number arriving. But the flow of people was endless and their labours were Sisyphean. 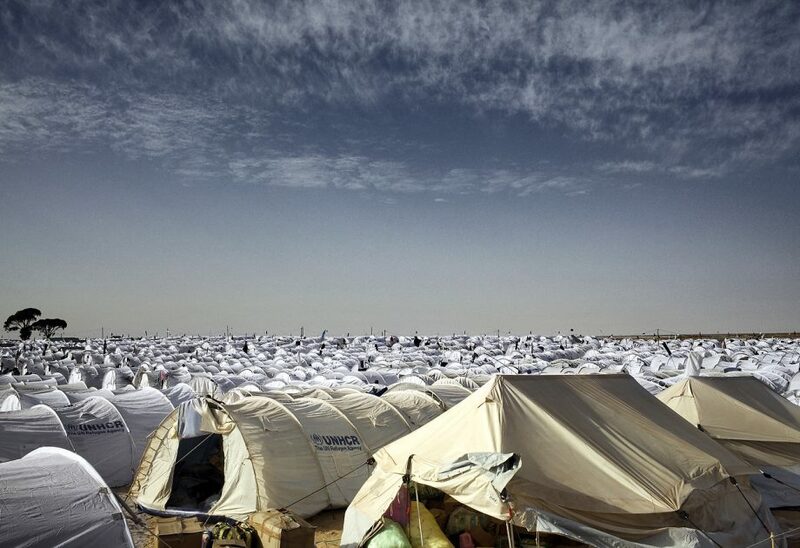 General view of the United Nations displacement camp on March 07, 2011 in Ras Jdir, Tunisia. As fighting continues in and around the Libyan capital of Tripoli, tens of thousands of guest workers from Egypt, Tunisia, Bangladesh, Somalia, Nigeria and other countries have fled to the border of Tunisia to escape the violence. The situation has turned into a humanitarian emergency as fledgling Tunisia is overwhelmed with the workers. Libyan leader Muammar Gaddafi has vowed to fight to the end. 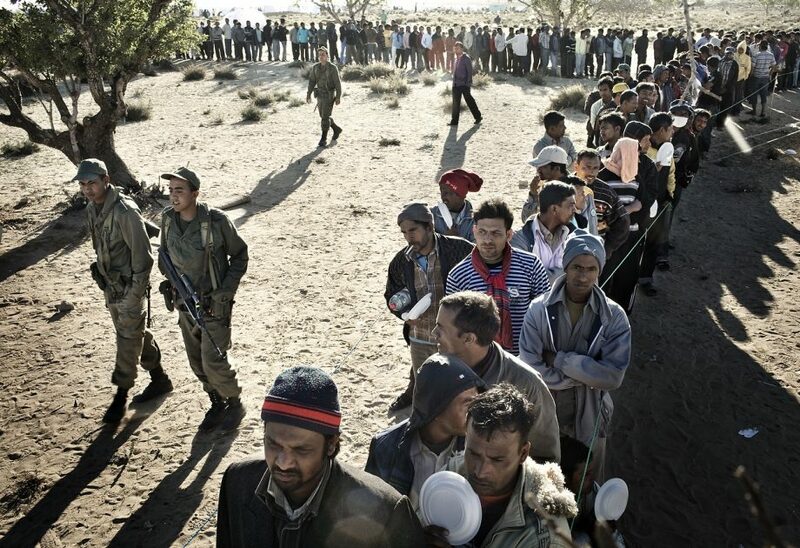 Men who recently crossed into Tunisia from Libya wait in line for food in a United Nations displacement camp on March 05, 2011 in Ras Jdir, Tunisia. As fighting continues in and around the Libyan capital of Tripoli, tens of thousands of guest workers from Egypt, Tunisia, Bangladesh, Somalia, Nigeria and other countries have fled to the border of Tunisia to escape the violence. The situation has turned into a humanitarian emergency as fledgling Tunisia is overwhelmed with the workers. Libyan leader Muammar Gaddafi has vowed to fight to the end. 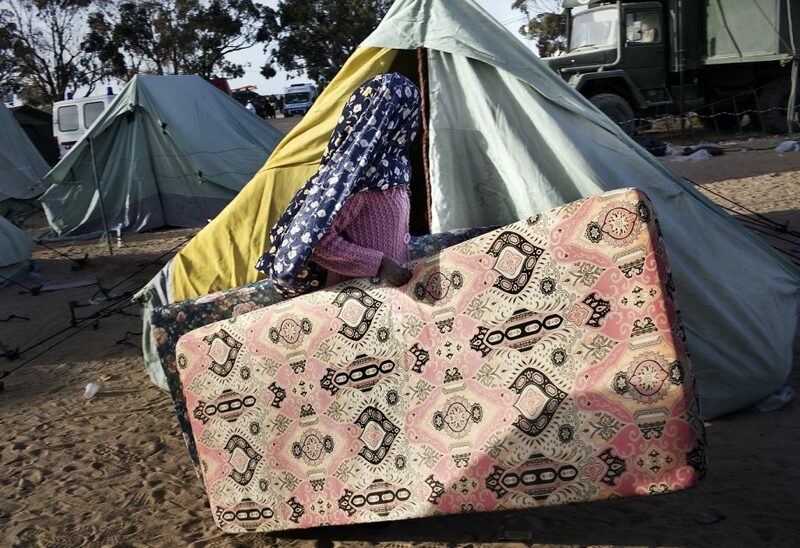 Somali women, who recently crossed into Tunisia from Libya caries two matresses to be her tent, in a United Nations displacement camp on March 07, 2011 in Ras Jdir, Tunisia. As fighting continues in and around the Libyan capital of Tripoli, tens of thousands of guest workers from Egypt, Tunisia, Bangladesh, Somalia, Nigeria and other countries have fled to the border of Tunisia to escape the violence. The situation has turned into a humanitarian emergency as fledgling Tunisia is overwhelmed with the workers. Libyan leader Muammar Gaddafi has vowed to fight to the end.